“Hi, my name is Christie. I’m 32 years old. later I came in and had it all chopped off. Along with a slew of other side effects, everything was out of my hands, everything that I had control of, I was losing control of. All these things were being done to my body; I was getting visible scars put on my body, and this was one of the few things that I could do that I had control over. I was going to cut off my hair before it was going to get taken from me. I love my wig. It makes me feel like myself, and it doesn’t advertise that I have cancer to strangers. I don’t like scars because I feel like they’re a big bulletin board that let everybody know I have cancer. And I’m not embarrassed by it, but it’s not something that I need to have people know all the time. And when I want to wear my hats, I wear my has, but I feel like myself when I wear my wig. I feel connected to the person who I was before I was diagnosed. Thank you. Thank you An’Tyrice Salon. Cancer has a way of trying to define you, but with this [wig], this doesn’t define me. This reminds me of who I am. And when I put this on, and I look in the mirror, I am reminded of who I am and who that person was before I got diagnosed. 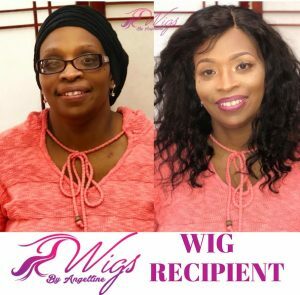 I came across Wigs by Angelline when I read an article, in the Hudson Valley Magazine, about her service in creating wigs with a person’s own hair. When I called them the staff were kind and patient with me. I came in for my consultation very confused; however I left the salon well informed and confident knowing that soon I would be getting my hair back. I also left with a cute pixie cut that I rocked for a month. When my wig arrived I did not believe that I was looking at a wig with my very own hair. It was an emotional experience and the staff were there to comfort me throughout the process. I left the salon feeling like my own self again. I couldn’t ask for a better experience with Angelline. I came to Angelline at her salon on a random day to inquire about her wigs. She answered all of my questions thoroughly and me feel comfortable. After I was done with my questions, she asked if I wanted to order the wig today. She was going to measure my head and give me a pixie cut. Although I didn’t feel ready, I knew it was a good idea to just get it over with, Angelline did the entire process that day. A few days later I was lucky I did it, because my doctor told me I had to go in for chemotherapy the next month. 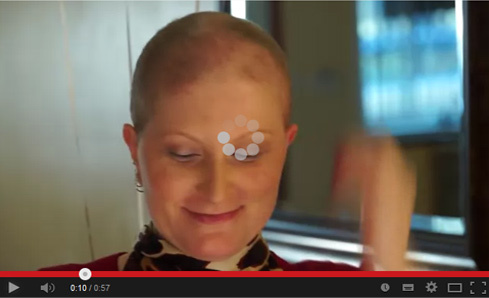 Just when I was starting my chemotherapy I had a beautiful wig with my own hair! I am so thankful for the wig and service the staff gave me. 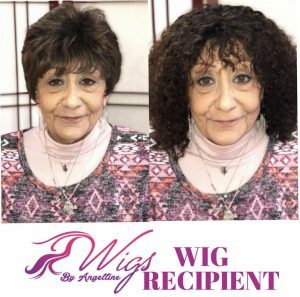 I was unfortunate enough to not have known of Wigs by Angelline before my chemotherapy removed almost all of my hair. However, I still went to the shop in order to find out if I was able to get a wig. To my surprise I actually was able to get my own custom wig. She helped me pick out which texture, length and type of wig that would best suit my lifestyle. After three weeks my wig finally arrived and it was everything I wanted and more! Although I did not have a wig made out of my own hair, I still had a wig that was well constructed. I treat the wig as if it was my own hair. I always get compliments about it! I first want to say thank you to Angelline Smalls for being so patient, understanding and caring throughout my emotional process. I cried the first day I met her because I was so happy that I found an organization that suited me and offered so much. She reassured me that everything was going to come out that way that I wanted my wig to look like. She cut my hair and left me with some hair that I was comfortable with. Within only three and a half weeks, my wig arrived and it was breathtaking because I didn’t think I was able to have this opportunity in having my own hair on my head again. She even styled the wig on me with nice curls, it felt like I was at back at the salon again getting my hair done before chemotherapy. I am truly blessed. I have been wearing wigs for good portion of my life and I’ve had many hits, but mostly misses. The whole process used to stress me out, because there was always a risk that I was going to spend a fortune on a wig that would eventually wear out within a month or two. However, I heard of Wigs by Angelline in the Hudson Valley Magazine and I decided to try them out for the heck of it. I first called the salon and the receptionist was welcoming, she helped me schedule my consultation. Once I arrived I had my consultation with the receptionist since Angelline was very booked that day. The woman answered my major concerns and reassured me that the hair that I was purchasing was the best of the best. Together, we looked at many textures of hair and we picked out which hair type and texture was suitable for me. I ended up picking out Malaysian Body Wave Full Lace Wig and I have been obsessed with my wig ever since it arrived. It is easy to manage and the texture feels just as good as I first felt it. These wigs are especially made for cancer patient survivors using their own natural hair. 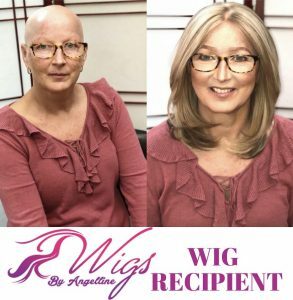 Being able to make wigs with the person’s own hair, especially for women who’s experienced hair loss due to chemotherapy autoimmune diseases and alopecia, is a personal fulfillment, not only for Angelline, for her clients.